Please be advised, on February 26th- 28th, our 2:00pm tournaments have been cancelled. February 26th will be the start of the relocation of the Poker Room to the Casino of the Earth, Hall of Lost Tribes. WILL YOU HAVE THE LUCKY SEAT? PRIZES AWARDED EVERY HOUR! 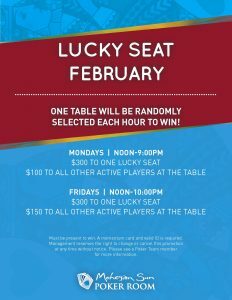 MONDAYS & FRIDAYS IN FEBRUARY! Must be present to win. A momentum card and valid ID is required. We are a quarter of the way through the first qualifying period of 2019! Eric Hall & Michael Thayer are neck in neck for top points at 320 & 310 points each. 20th & 21st are tied with 100 points. On Sunday, January 6, 2019 we hosted our first $230 Buy-In, Bounty tournament! We had a total of 46 entries in our first event and are looking to only go up from here! Please be on the lookout for changes coming this New Year with the relocation of our Poker Room to the Casino of the Earth in the Hall of Lost Tribes. Our FIRST Freeroll of 2019 has a total guaranteed prize pool of $14,163! There will be a total of 154 players returning to play on Tuesday, January 29th, 2019 at 6:00pm. Registration will only remain open until 7:00pm (1 hour), no exceptions. Listed (below) are the top 20 players of the Freeroll who will receive a starting stack of 20K in chips vs. 15K for the remaining 134 players. The top 20 will also receive a $10 daily food comp for February 2019. As of January 2nd we will be removing the 10k guarantee from our Wednesday night tournament. Please check back for our new upcoming tournaments after the poker room relocation. 2018 Holiday Hangover: Grillo Takes the Holiday Hangover 1st Place Title! Congratulations to Anthony Grillo for winning the 2018 Holiday Hangover! He was guaranteed $18,000 and played for the win, receiving a total of $21,700 plus the trophy! Grillo, “Cheesin” – his words, not mine! Anthony had the biggest smile (I think we have ever posted on this blog)when he won the event! He shyly claimed that this is his first EVER tournament cash. He attempted a $400 buy-in at Foxwoods last month, firing in a few bullets and was disappointed with his play. He said this time around, he was more patient. He also veered away from his play that he finds success with in cash, as he quickly realized that they are two different beasts. He was excited to play against last year’s returning Champion, Souka Kachittavong, and never imagined he would take the win when Souka had him massively out chipped. Anthony resides in Fairfield County, CT and was sad he was unable to share his win in person with his girlfriend. He decided that he wants to celebrate with her by taking her to the Bahamas in February! He also promised he would treat himself to a new phone. Congrats Anthony on your 1st place win! We look forward to seeing you soon! 2018 Holiday Hangover: The Final 3! The final three players decide to negotiate a chop based on chip stacks and play it out for the trophy and the remaining $3,700.00. Chips leader, David Valone is guaranteed $19,000. Second in chips, Anthony Grillo, secures $18,000, and Souka Kachittavong is set to take $17,000. Shortly after the negotiation, Anthony Grillo ends up taking David Valone out in two large hands and has a decent chip lead over Souka. For over two hours, Souka and Grillo battle it out heads up where at point, Grillo is out chipped by Souka; Souka has 10M plus in chips, Grillo is just hanging on with over 4M in chips. Grillo regains momentum and comes to a point where he has Souka out chipped by about 1M in chips. The final hand plays out with Souka and Grillo both all-in. Souka has KJ, and flops a jack. Grillo has AQ and rivers the straight for the win! Great play by both players! Congrats to Souka for another cash in a Mohegan Sun tournament series! Souka recently placed in two of our Summer Showdown events this past August, and was our returning Champion from last year’s 2017 Holiday Hangover!